Global folding boxboard market expected to generate around USD 14,343 million by 2025, at a CAGR of around 5.4% between 2019 and 2025. 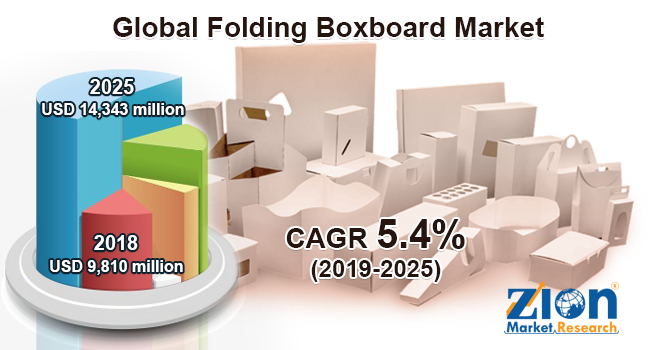 The rising demand from various industries, such as food and beverages, pharmaceutical, cosmetics, etc., are expected to propel the growth of the global folding boxboard market in the future. The report encloses the forecast and current estimate for the folding boxboard market on a global and regional basis. The study provides the data of historical data for 2016, 2017 and 2018 and the forecast period from 2019 to 2025 based on revenue (USD Million). The study also provides the impact and the descriptive analysis of major drivers, restraints, and opportunities of the global folding boxboard market. The study also offers the market attractiveness and Porter’s Five Forces model analysis to gauge the competitive landscape of the major vendors of the global folding boxboard market. This comprehensive study also provides a detailed analysis and an overview of each segment included in the study. The report segments the global folding boxboard market by material, application, and region. All the segments have been analyzed based on present and future trends and the market is estimated from 2019 to 2025. The regional segment includes the historic and forecast demand for North America, Europe, Asia Pacific, Latin America, and the Middle East and Africa. Some key industry participants of the global folding boxboard market are Nippon Paper Industries, Mayr-Melnhof Karton, Mondi Group, Metsa Board Group, ITC Limited, Kotkamills Oy, SAPPI Limited, Shandong Bohui Paper Industrial Company, Stora Enso, International Paper Company, Iggesund Paperboard, Hangzhou Gerson Paper, Antalis International, Hongkong Eastern Dragon Group, Leanpack, CartonHub, Box-Board Products, JK Paper Ltd., and Beloit Box Board.